Paul Ryan is in Florida today promoting his Medicare plan, but there’s a part of his plan that he very carefully avoided talking about: what he’ll do if his cost controls don’t work. Let’s recap: Ryan’s plan relies on competitive bidding to hold down costs. Insurance companies bid for Medicare contracts, and seniors all get a voucher that allows them to purchase the second cheapest plan. They can buy one of the cheap plans; they can buy standard Medicare (which submits a bid along with everyone else); or they can pay more and buy a more expensive plan. By itself, there’s nothing wrong with this. There’s good evidence that competitive bidding is a useful part of the healthcare discussion and can indeed help control medical costs. But how much? Critics like to point to Medicare Advantage to show that competitive bidding has been a failure. But that’s a mistake: although MA has indeed been a failure, costing taxpayers more than traditional Medicare, that’s partly because it’s based on some rather convoluted formulas that prevent us from getting a good idea of what competitive bidding could accomplish if it were designed right. But there’s another reason it’s a mistake to focus on MA: you don’t need to. gets the bids, it chooses one of the low bidders. This is competitive bidding in its purest form. So how has that done at holding down healthcare costs? In case you need a hint, the charts on the right tell the story. Since 1999, according to the Kaiser Family Foundation, group insurance premiums have gone up 168%. 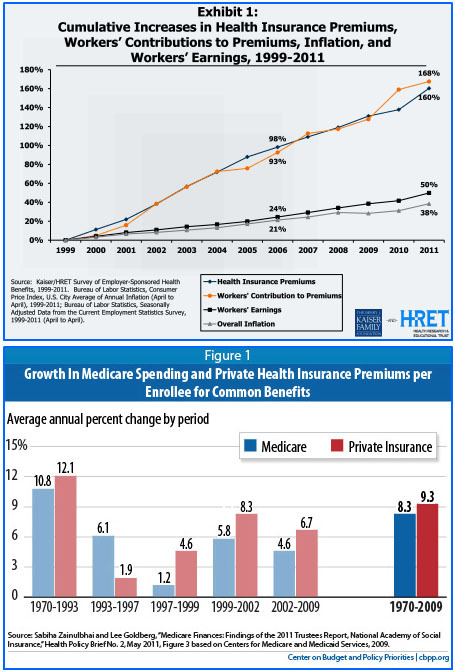 And CBPP reports that private insurance costs have risen faster than Medicare costs consistently over the past four decades. Private corporations all rely on competitive bidding, and it just hasn’t done much to hold down costs. That’s because the real source of America’s high medical costs is the fact that we simply pay more than other countries for everything we get: more for doctors, more for procedures, more for hospital stays, more for drugs, and — yes — more for insurance. If you really want to hold down costs, you have to hold down costs at the source, and Paul Ryan’s Medicare plan has no mechanisms for doing this. It relies solely on competitive bidding, and there’s very little chance that this alone can keep Medicare costs from outpacing his “fallback” growth cap. It’s a near certainty that his growth cap will be the real mechanism for reining in costs. So again the question is: what happens if health providers bid for Medicare contracts but the bids all come in higher than Ryan’s growth cap? Do premiums go up for seniors? Ryan doesn’t say so, but then again, he also refuses to say what would happen. But there’s no fairy dust here. If costs under the Ryan plan go up more quickly than his growth cap — and they almost certainly will — then someone has to pay the difference. And that someone is either beneficiaries or taxpayers or healthcare providers. There aren’t any other choices. But it can’t be taxpayers, because that undermines the whole point of the plan. And it can’t be providers, because Ryan’s plan has no mechanism for cutting payments to providers. In fact, he and Mitt Romney have recently abandoned even the existing provider cuts contained in Obamacare. So all that’s left is seniors. Every year their voucher will cover less and less of the cost of the cheapest plan, and seniors will have to pay more and more out of their own pocket. By refusing to address this issue, Ryan has successfully kept things vague enough that no one can produce hard numbers about how much more seniors would end up paying. But it would be a lot.